I invented this recipe in honor of the late Floyd Mahon, who was like an uncle to me (me and so many others). Floyd died two years ago from colon cancer. He was one of the best men I’ve ever known and ever will know; I say that with certainty because he was one of those rare, exceptional people who had the ability to make everyone laugh, make everyone feel special. You didn’t have to know him long to feel like a longtime friend. He was a character and an excellent cook. Because of that legacy of a life well lived, his family throws Floyd-fest each year to honor him. This year, the theme was Cancun which was Floyd’s favorite place. Keeping the Cancun theme in mind, I whipped up this dessert in honor of Floyd. Trifles are one of my favorite desserts because they are easy, pretty, creamy, versatile and feed a crowd. And of course, who doesn’t enjoy sipping a pina colada on a beach in Mexico? 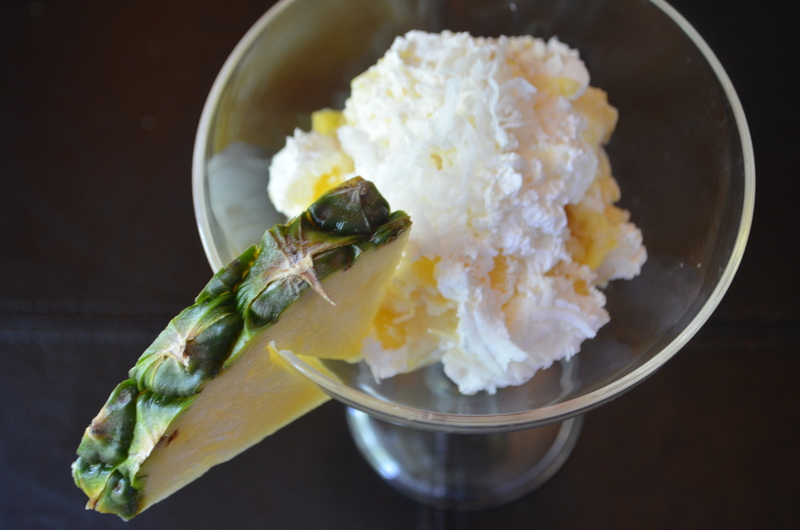 This dessert just seemed like him: fun, sweet, tropical, different. If you make it for adults only, you can double the rum. Floyd-fest was a blast. About 80 people came throughout the day and night. There was a spread of amazing food and drinks. He sons and son-in-laws made incredible pulled pork, fish, steak and chicken and there was a taco buffet. There was a salsa competition (I took best overall salsa 🙂 ), and his entire family pitched in to make the day special and fun for everyone. It was quite the effort of love. Another amazing thing at Floyd-fest was his family releases balloons with a self-addressed postcard attached that tells a little about Floyd and asks whoever finds the postcard to drop it in the mail and tell them where it landed. The postcards have been returned from other states. It’s such a cool idea. As a world traveler myself, I want my family to do this to honor me one day. If Floyd was alive, I hope he’d say this dish is “El Good-o”, that’s one of his many funny sayings. I hope you find an occasion to share this recipe. Cheers to Floyd, his family, and his legacy. Bake cake according to package directions and 5 minutes after you remove it from the oven, brush it with rum. Set aside. Empty two packages of coconut pudding and whisk together with coconut milk, half and half and rum extract. Whisk until well combined and cover and refrigerate. Peel and chop the pineapple into small bits. To assemble the trifle, break half the cake up and place it in the bottom of a bowl or trifle dish. 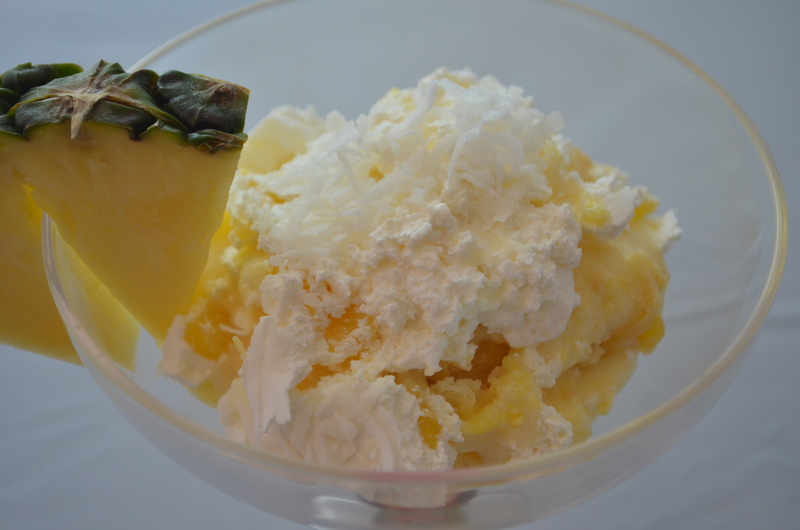 Top with half the coconut pudding, half the pineapple and a thin layer of whipped topping (using only a third of it). Then repeat the process to create the second layer of the trifle and top it with remaining whipped topping and shredded coconut. Cover and chill 2 hours before serving. This entry was posted in Desserts and tagged coconut, dessert, easy, Entertaining, festive, fun, mexico, pina colada, pineapple, rum, white cake on August 3, 2015 by Juliana Goodwin.